If you haven’t already, go ahead and cancel your dinner plans. That’s right, go ahead. I’ll wait. 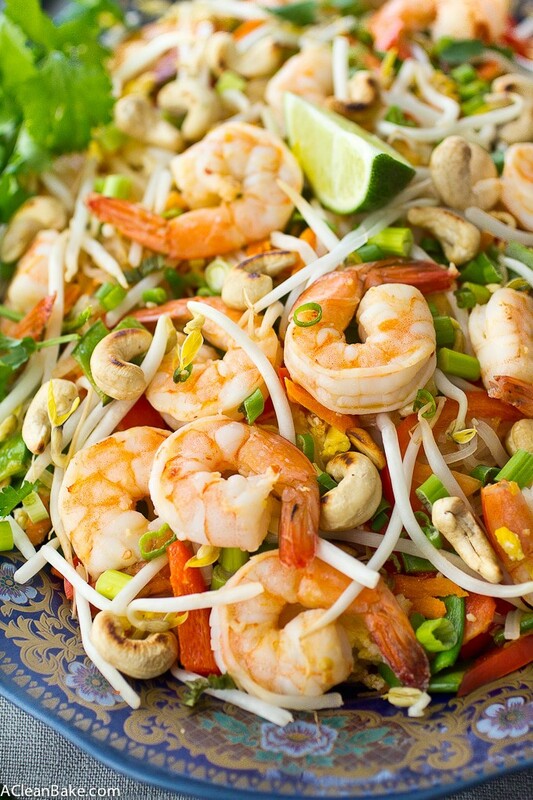 This homemade pad Thai is SO much better than whatever you had in your meal plan. A number of you who answered the reader survey (if you haven’t yet, it’s not too late! Your responses are always helpful!) have requested DIY versions of takeout and/or Asian dishes, so I knew you’d like this one. I’ve made it approximately one million times (ok, ok, give or take a few… I had to leave a few shrimp in the ocean) and it never gets old. 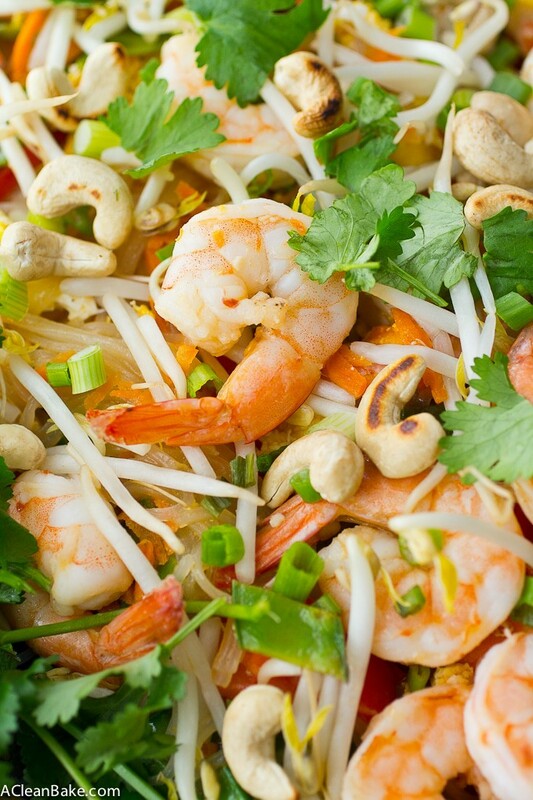 Even if you don’t think you like Thai food, give this dish a shot. The benefit of DIYing a dish you usually order is that you can make it however you like it: dial down the oil/dial up the spice/load on the veggies/whatever floats your boat. 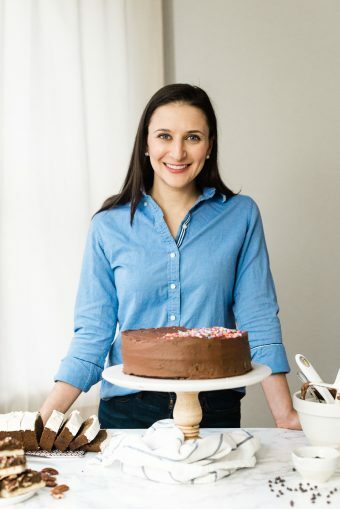 The most challenging part of this recipe is the grocery shopping or, as I’ve fondly begun to refer to it, the ingredient-hunting. It can be a little tedious to find a few of the ingredients, so plan accordingly. The trickiest one to find is tamarind paste (which is really more of a syrup than a paste – go figure). I checked a million stores, and was finally able to find de Siam brand paste at a local European market. Supermarkets may have it in the “ethic foods” aisle, near the Asian condiments, and you can also order it online. The only other unusual ingredients that this recipe calls for are fish sauce, rice vinegar and chili paste, all of which should be available in the Asian foods section of major supermarkets. Of course, you can get all of this at most southeast Asian (Thai, Vietnamese, etc) markets, if you happen to have one nearby, too. The recipe is long. Just be prepared! However, it’s not complicated at all. It just requires a little bit of prep. Actually, total prep. I’ve been trying to help Bryan (my husband) learn how to cook, and the #1 rule that I am drilling into his head is to have all of his ingredients fully prepped and ready to go* before he is allowed to so much as pick up a skillet. Anyway, it’s good rule of thumb for all of us to follow, and as long as you have your sauce mixed and all of the other ingredients washed, chopped as measured, this recipe will be a breeze. Oh! And at the risk of sounding like a total dictator, one more thing: I have to insist that you read the recipe through entirely before you start, so you know what’s coming. As with most stir-friend Asian dishes, this one moves fast, and there’s no time to catch up. *In fancier kitchens, they call this mis en place, which is French for “everything put in its place”; in our house we call it pourquoi n’est rien prepare!?!?!? (excessive punctuation mandatory), which is (me barking in bad) French for “WHY IS NOTHING PREPPED!?!?”. Homemade Pad Thai is possible! It takes a little prep work, of course, but it's so worth it. This version with shrimp is gluten free and dairy free, too! 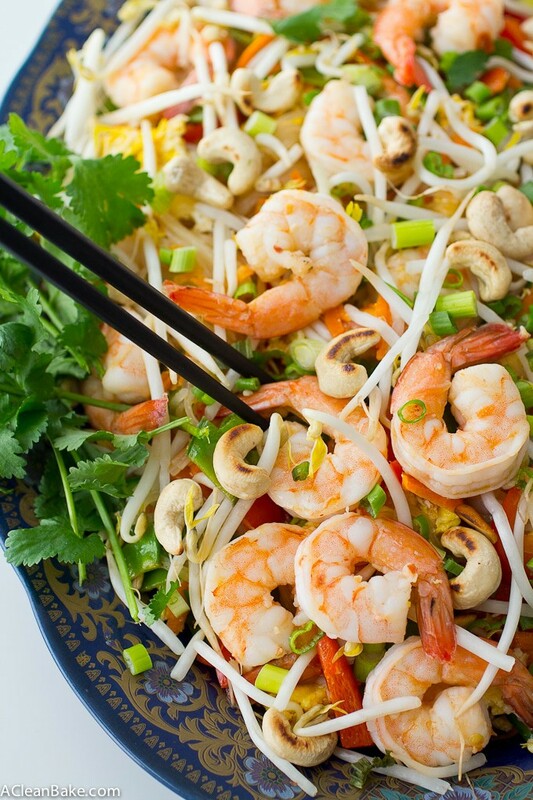 Place the rice noodles in a large, heatproof mixing bowl. Cover with boiling water and soften until al dente, about 5 minutes. Drain and toss with 1 Tablespoon of sesame oil. Set aside. Make the sauce by whisking together the tamarind paste, fish sauce, honey, rice vinegar, 1 Tablespoon sesame oil, 1/2 teaspoon chili paste, 1/2 teaspoon garlic and lime juice in a small bowl until combined. Set aside. 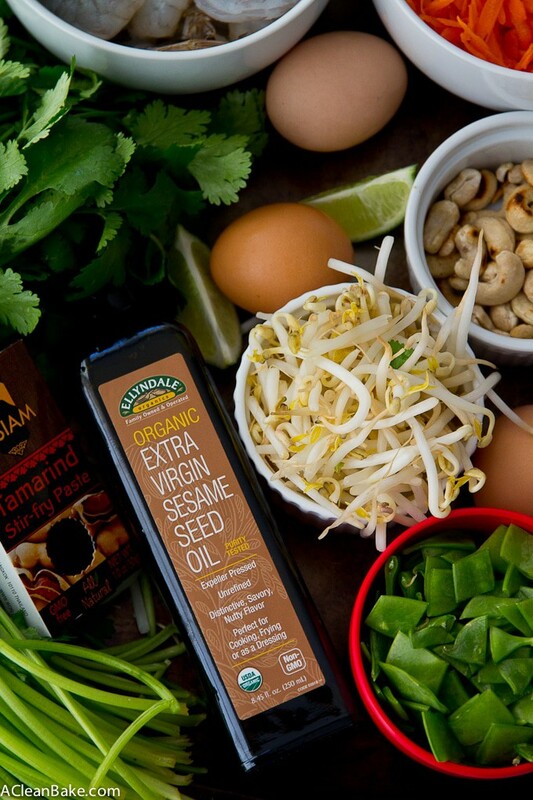 Preheat a large skillet or wok and add 1 Tablespoon sesame oil. When the oil is hot, add the remaining 1/2 teaspoon garlic and sauté briefly. Then add the shrimp and remaining 1/2 teaspoon chili paste. Saute until cooked through. Transfer from the pan to a bowl and toss with 1-2 Tablespoons of the prepared sauce. Add the remaining 2 Tablespoons sesame oil to the pan. When the oil is hot, add the eggs, and scramble until about half cooked (soft and runny). Add the carrots, snow peas and red pepper and toss to combine. Add the noodles and the remaining sauce. Toss to distribute everything, then cover and allow to steam for 3-5 minutes, until the veggies are tender and the noodles are softened. Add the shrimp and its sauce into the pan and toss with the noodles and vegetables. 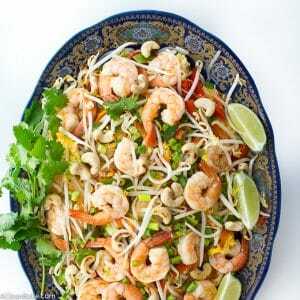 Serve immediately, topped with generous handfuls of scallions, cashews, bean sprouts, Thai basil and several lime wedges. Squeeze the lime wedges over the noodles before digging in. 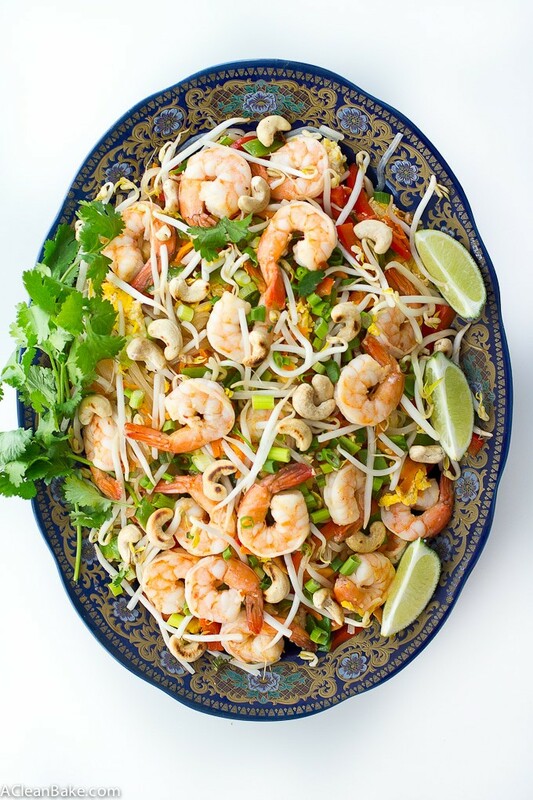 Yuuuuuhs, I absolutely LOVE Pad Thai, and am super psyched to try your authentic homemade version. I’ll have to snag some sambal oelek and tamarind paste online and get to cooking! Heck yes! It is totally worth it to try to track down those trickier ingredients. The dish just doesn’t taste right without them! This looks wonderful, Nora! I am so obsessed with pad see ew that I’ve never attempted pad thai at home, but this looks so amazing that I’m going to have to try it. I am going to try this for some friends this weekend. About how many would it comfortably serve? Thank you! Great! It’s always hard with things like this, but I would estimate it serves about 4-5 people. Maybe 6, if you have lighter eaters! Thanks, Julie! Let me know how it goes!